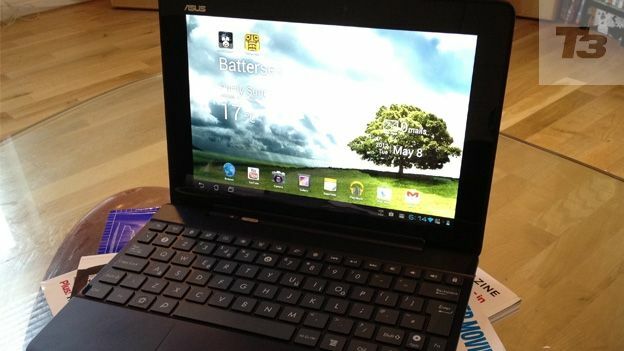 If the Asus Transformer Prime turned your head but hurt your wallet then you'll love the Asus Transformer Pad 300 (or Asus Transformer Pad TF300T, to give it its full title). This Tegra 3 tablet has all the power of its older brother, but comes in at roughly the same price is the new iPad 3, Samsung Galaxy Tab 10.1 and Motorola Xoom 2. When Asus announced it was to release an entry level Transformer, we had no inkling that it would pack so much power. This Ice Cream Sandwich sporting 10-inch tablet is powered by the latest Nvidia Tegra 3 chip, clocked at 1.2GHz, and weighs 637g, fractionally lighter than the new iPad. The Transformer moniker comes from the familiar keyboard dock, which transforms the TF300T tablet into a netbook-hybrid, and this is included in the £399 price. The dock adds extra battery life to the tablet, taking life up to a quoted time of 12 hours. If you're wondering how Asus has managed to pack all the goodness of the Prime into the TF300T and keep price down, look to the build quality. The metal back has gone and been replaced by a flexible plastic panel, the keyboard is flimsy and the keys are noticeably less refined. However, to us, this matters not one jot. The TF300T is still streaks ahead of its Android competition, and we love it. The 10.1-inch display has a 1280 x 800 IPS panel, which did lack the punch and vibrancy of its competition. Colours were well represented, but the screen wasn't as sharp as the new iPad or the Samsung Galaxy Tab 10.1, and it was extremely reflective. The forthcoming Asus Transformer Infinity 700 will have a full 1080p screen, but this is one area the TF300T does fall down. When playing Temple Run and Riptide GP, and looking closely at HD content, blacks were distinctly blue, and noticeably noisy. As you'd expect from a Transformer, the seamless connection to its base station is a joy to behold. There's a brief flicker as the tablet clicks into the dock, before the mouse trackpad and keyboard become live. The keyboard is very cramped, but adequate for writing emails or amending documents in the supplied Polaris Office app. On the flip side, travel was minimal, cushioning non-existent, and there was major flex in the middle of the keyboard, making extended typing labourious. The mouse, however, is a triumph. It's generously sized, and supports multi-touch gestures, which enable you to navigate the multiple screens of the Android home page with ease. A major compliment to the Transformer's usability was how we returned to the tablet mode time after time, which was fast, responsive and silky smooth, in no small part due to the quad-core Tegra chip. The TF300T scored a staggering 9623 in our Antutu benchmarking, which is vastly superior to any of its rivals, bar the TF201 Transformer Prime. 3D gaming also scored highly, which was reflected in our real-world gaming tests. We played endless games of Temple Run and Riptide GP, with no sign of slowdown, and enjoyed enhanced graphic effects such as splashes and drips, thanks to the Nvidia Tegra 3 chip. The Tegra Zone also has some excellent titles, exclusive to quad-core toting tablets. Navigation through Ice Cream Sandwich was also seamless and smooth, and the TF300T rarely paused for thought, although we did have issues with some strange noise to the left of the screen. A couple of apps fell victim to this, but hopefully the issue will be fixed via an update. Battery life was strong in our tests, even under extremely heavy load. We looped Kanye West's Runaway video, in HD and streamed from YouTube for 416 minutes before the Transformer TF300T finally gave up the ghost. At nearly 7 hours of HD streaming, the Transformer is one of the best performers on the Android tablet scene, and longevity is boosted even further when connected to the keyboard, with 12 hour's use easily achievable. When the chaps at Asus told us they were launching an entry level Transformer product, no-one dared believe it could be this powerful. Yes, build quality has taken a major back seat, but the beating heart inside the tablet hasn't been throttled back. When you release a tablet at £399, you're asking for direct comparisons to the iPad, so here they are. The TF300T has double the storage, a great range of apps, equally great performance, near identical weight and the keyboard docking station. The thinking consumer should seriously consider the TF300T, but one look at the iPad's Retina screen and app selection, compared to a lacklustre performance here will only end with one winner. However, if you're looking for a top hybrid tablet, with stacks of personality, great performance, versatility, features the latest version of Android with all the usability of a netbook and the fun of the iPad, then look no further than the Asus Transformer Pad TF300T.